Having strong and healthy fingernails is more important than a good looking manicure. 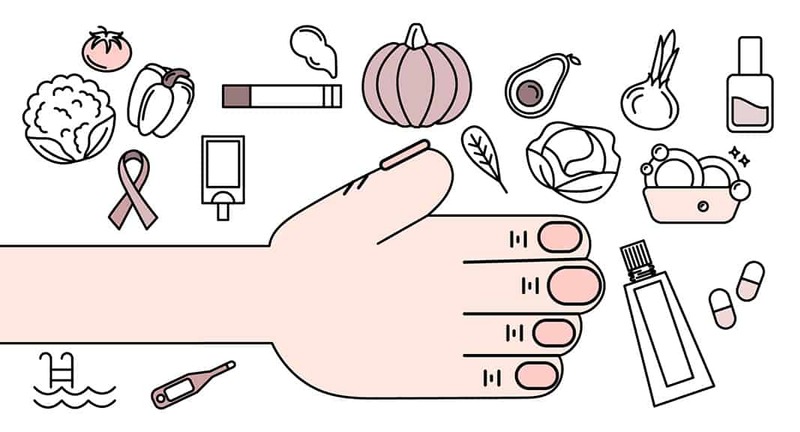 In fact, what your nails look and feel like has more health significance than you may realize. Nails can actually tell you a lot about what’s going in your body, including if you have any deficiencies, thyroid issues, or more severe illnesses and diseases. What Are My Nails Telling Me? Take a close look at your bare nails (no polish, please!). If you see or feel anything abnormal—such as a ridge, brittleness, or pale yellowing—it may be a sign of a health issue. Continue reading to get some clues as to what may be happening. Healthy nails are typically a shade of pink and have white tips. If they look dull in color, you might be experiencing a vitamin deficiency. While it’s nearly impossible to know exactly which vitamin you need more of, vitamin B promotes healthy nail growth. Adding eggs, whole grains, salmon, lentils, spinach, and other foods rich in vitamin B can help strengthen your nails and return them to that healthy shade of pink. Subtle dents that run horizontally across the nail are called Beau’s lines. Beau’s lines can be associated with more severe issues such as diabetes, high fever, or pneumonia. But don’t panic just yet. Indentations in the nails can also be a sign of zinc deficiency. If that is the case, consider adding zinc-rich foods to your diet such as pumpkin seeds, lamb, cashews, or chickpeas. Do you ever experience nails that quickly crack or split? There are a few potential causes for brittle nails. The most likely culprit is nail dryness, which can occur from innocent activities such as swimming, washing dishes, or using large amounts of nail polish remover. However, if you deal with brittle nails on a consistent basis, this could also be a sign of a low functioning thyroid, called hypothyroidism. Talk with your doctor to schedule a routine blood test to find out if your thyroid could be to blame. Additionally, adding foods such as cheese and soybeans to your diet can’t hurt. They are both excellent sources of an amino acid called tyrosine, which can help strengthen the thyroid. Most innocently, yellow nails are caused from wearing acrylics or certain colored nail polish. It may also be a sign of aging or a side effect of smoking. Rarely this yellow tint is yellow nail syndrome, which is when nails thicken and nail growth slows. Yellow nail syndrome could be a sign your body is batting a disease such as chronic bronchitis or cancer. Bottom line? Talk to your doctor to see what yellowing could mean for you. There are a few reasons for little white flecks on your nails. Most likely, white spots on the nail signify that you need more calcium and vitamin C in your diet. Eating raw nuts, yogurt, cheese, legumes, oranges, and bell peppers can help you get both. However, white spots can also be a sign of a fungal infection, allergic reaction, or even a systemic disease. Pay attention to what your body is telling you; ask a medical professional to take a closer look if you feel it is necessary. A typical cause for little dents on your nails is jamming them or other direct trauma to the nail. However, if you see ridges on multiple fingertips, this could mean your body is combating something more serious. Ridges sometimes form when the nail stops growing because your body focuses on combating an illness. Lastly, another culprit of ridges is aging or iron deficiency. If ridges pop up on multiple nails and do not go away, see your doctor for clarity. Irregular looking nails can have several root causes—some less severe than others. If you’re worried about your nails, talk to your doctor. Keep in mind: Anything that looks funky on your nail is a sign something might not be quite right. A balanced approach to healthy living is one way to keep your nails looking strong and healthy.